There are a couple of very powerful ways you can share your expertise outside of your EzineArticles account. One such example is placing your Expert Author RSS feed on your own website. This gives your site visitors a chance to see the extent of your expertise directly. RSS (also known as Real Simple Syndication) is a way for people interested in certain topics to be instantly updated when new content on those topics is published. RSS feeds provide a stripped-down version of the new content in a flexible web format that can be placed on websites or read with an RSS reader. All EzineArticles Expert Authors with at least one published article have an RSS feed set up for their articles. The Expert Author RSS feed shows a summary of your bio and your most recent articles with the title, published date and a summary. Go to your Expert Author Bio. You’ll be taken to a webpage depicting your RSS feed. Copy the URL for that page onto your clipboard. EzineArticles gives you easy access to your own Expert Author RSS feed, but you don’t have to limit your use of RSS in article writing and marketing to just that. 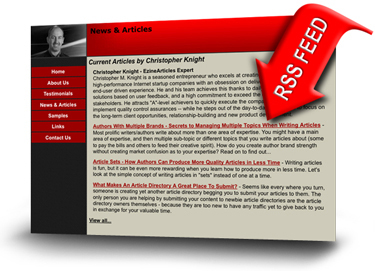 In addition, you can use an RSS reader to keep tabs on what other people in your niche are writing about. You can choose to follow a single person or a whole niche. Find an RSS reader and download it. Go to the main page for the niche or the author bio. Hover over the RSS Icon . Click on your preferred RSS Reader Button in the drop-down menu. Follow the directions for your reader on adding a new feed. With RSS, you can include your Expert Author feed right on your own website, and you can use an RSS reader to keep you up-to-date on your niche. Now, go and try to incorporate the use of RSS feeds into your overall article writing and marketing strategy. Also, leave a comment to share your experiences related to RSS feeds. This is great news I’ll definitely incorporate this into my website design. I like the way the RSS Feed presents the topics. Am definitely using it on my website. Though the conversion is very low, it meets the purpose for which it was designed. this is soo helping to me as it change my mentality about RSS. I was puzzled with the ways to install it. Now got proper direction. Let me do it and see. I like the concept of RSS – It’s something new for me and we are implementing it on our web strategy. However, I do have question, will EzineArticles ever syndicate contents to other websites? Unknown. Right now, no… and there are no plans to change that policy. I am so pleased you have done this, I have quiet a few different RSS feed setup so this is ideal for me. This is excellent!! I’m so glad I’m an EzineArticles Author, you guys always have such valuable tips and advice! is very cool if you don’t know? try it. Another easy way to get your RSS feed published is to write a couple of articles and put them on a Blogger Blog. It is really easy to add an RSS feed to a Blogger or WordPress blog. Make sure the article you build the Blog with does not have too many commercial links or your blog will be deleted.